Mankind has finally found peace and immortality, through technology, genetic and social engineering. However, it did not come without a price. The human race has finally forsaken war, violence, hatred and inspiration. Without ambition or a future to fear, fewer and fewer children are born, the desire to explore outside the solar system is gone and the human race is in decline. When a peaceful alien probe from ancient civilization enters the solar system it rekindles an interest in the universe. An interstellar gate is built on the surface of Pluto so that the human race can meet the ancient makers. However, when the gate opens hostile forces pour out, intent on the genocide of the human race. Facing extinction the great artificial intelligences reach back into the history of the human race and resurrect the warriors of the past to fight for the future. In 1992 Eric Evans had served his four years. While a member of the US Marine Inactive Ready Reserves he was killed in the line of duty as a junior police officer. 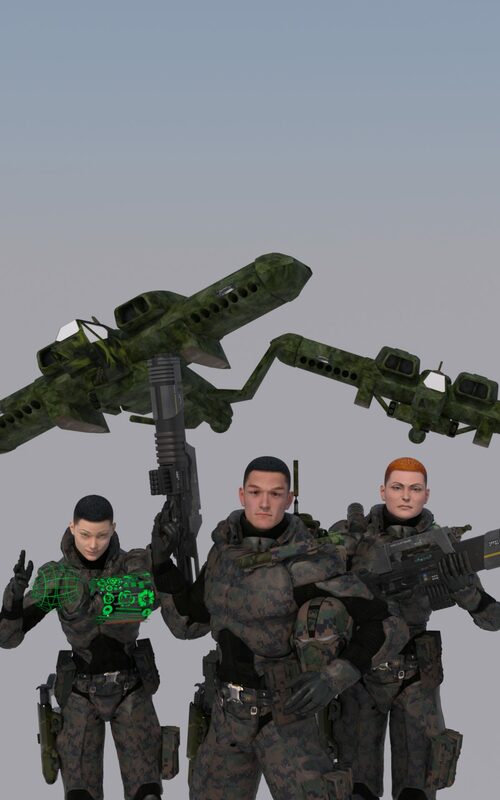 It is the year 4207 and Corporal Evans is being called back to active duty to finish his obligation, to fight as a Sol Coordination Marine, to assault the enemy and push them back in order to save the human race. He is one of many and the enemy will soon learn the fury of the Sol Coordination Marine Corps.